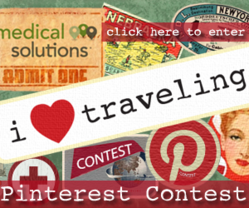 Medical Solutions launches their first Pinterest Contest, "i heart traveling." Winner receives a $250 Amazon Gift Card. We are very proud to be the first company to host a Pinterest contest in our industry. It’s exciting finding and tuning in to new ways we can interact with our Travelers, especially on a fun platform they really enjoy. Medical Solutions, a leading national healthcare staffing and travel nursing company, is excited to launch their first ever “i heart traveling” contest on Pinterest, the newest social media craze. From June 11th through June 29th, Pinterest users are encouraged to create a board with pinned images that correspond to 7 travel-themed descriptions which will be provided. Boards will be judged based on uniqueness, creativity, travel spirit and adherence to the guidelines. The winner will receive a $250 Amazon Gift Card. Medical Solutions prides themselves as being the leader of engaging their travelers through social media in the travel nurse industry. “We are very proud to be the first company to host a Pinterest contest in our industry. It’s exciting finding and tuning in to new ways we can interact with our Travelers, especially on a fun platform they really enjoy,” said Jeannie Holmes, the Marketing Specialist for Medical Solutions. The Omaha company was also the first in their industry to launch a true mobile site in June 2011. Medical Solutions encourages current non-Pinterest users to make an account so they can participate in the contest. You can currently follow Medical Solutions on Pinterest here: @MedSolutions. Please visit http://www.medicalsolutions.com/pinterestcontest for official rules and to enter the contest.